More important than the questions we ask Him are the questions He asked us. 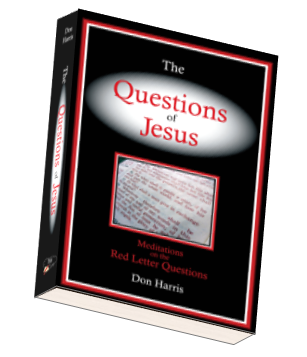 This great devotional book and study source revisits and offers new perspectives on some of the most familiar Scriptures in the world, the questions in red letters, the questions of Jesus. There are 151 questions, formulated in the mind of the Son of God, recorded in the Scriptures. This book explores them all. The Gospels will never be the same! His questions will challenge us … the answers will change us. I wanted to let you know how much I have been blessed by your book “The Questions of Jesus”. I must confess that I was a bit skeptical when you gave it to me. …Experience has taught me to be wary. I stuck the book on my bookshelf with the thought that I would preview it and toss it later. Well, I have previewed the book, at least the first thirty-five questions, and I am ashamed of myself for judging a book by it’s cover–so to speak. I have been both convicted and encouraged by your insight into scripture and your ability to succinctly address the issues we all face as followers of Christ. I can get discouraged with the apathy I see in the “church” and partially so because I struggle with the same apathy in my own life. Your book has been an encouragement to me- Thank you! We have been discussing some of the topics you address during our family devotions and it has sparked lively discussion–a good thing!